Despite most eyes being on Scotland these past weeks, pollsters have kept trotting out their regular snapshots of voting intention at the general election. And their findings have confirmed that the Ukip bounce is back. 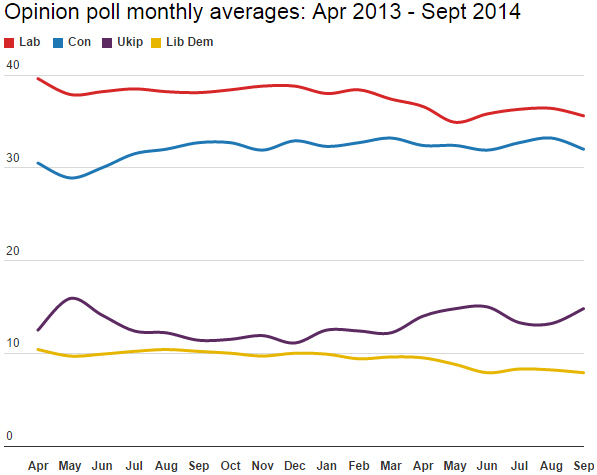 The Tories usually do pretty well at staying above 32%, having fallen beneath it only twice in the past 12 months. They’re now teetering on the brink, however, with a polling average currently of 32.0% (31.96% to be precise). The gap between them and Labour is 3.6 points. 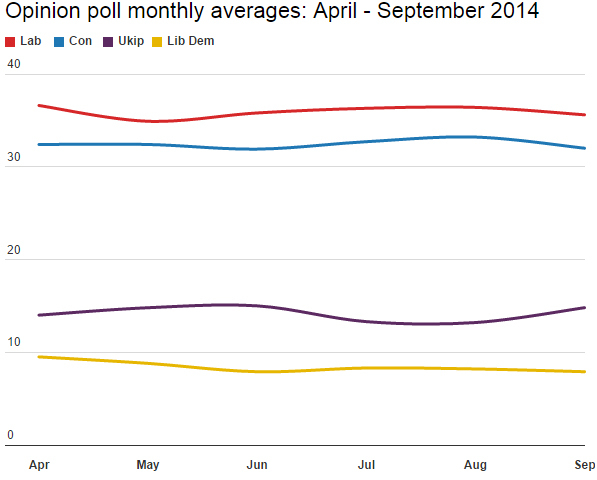 Labour’s average for September is 35.6%: its lowest since May. This would be enough for them to win the election, especially given the Tories are so far behind. I’ve written before about how a 35% share might the best any party can hope to achieve at the 2015 election. Remember Labour won a 66-seat majority in 2005 with a 35.2% share. The Lib Dems are just below 8% again, on 7.9%. For Ukip, any rise in the polls is a reason to be cheerful, not least as it gets them talked about (witness this blog). This month’s polls suggest that even when much of the country is talking about something else, the party is doing enough to sustain a slow-burning momentum. It’s still nothing like the sort of trajectory it would need to win seats at the election, but it’s probably enough to get the other parties discomfited and prone to expedient policy shifts and opportunistic announcements – two more things upon which Ukip thrives for its existence. Meantime we’re now into party conference season, and it’ll be interesting to see if the three main parties benefit in the polls from what ought to be a full-throated pre-election rallying cry.